As preserved rollingstock ages, remaining stocks of traditional spare parts dwindle and commercial production of many components ceases the challenge for heritage groups to maintain, repair and restore vehicles is becoming harder and harder. Recently Goodwin Alco inconjunction with Blueridge Woodworks was asked to investigate the production of new wooden window stock for Lachlan Valley Railway "S" series cars which after many years of service were in dire need for replacement windows. After following up on several options Bob & Jono Bennett from Pinnacle Cabinets & Joinery at Molong NSW provided not only a quote which was affordable but also committed to manufacturing the windows using traditional joints and practices and utilising new glues and modern paint finishes to ensure the windows will last for many years to come. The frame machining was also modified slightly to incorporate the important inclusion of safety glass. The windows were supplied finished with glass and mouldings fitted in our choice of paint and internal lacquer finishes. The boys can even quote to deliver and fit the windows if you require. 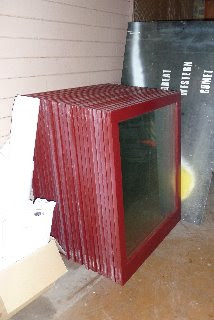 If you have a need for any type of window or woodworking components give them a call on 0263691500 or 0428328587.